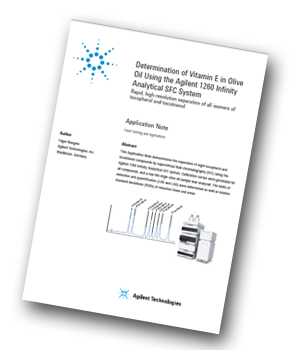 Agilent Technologies has produced an application note demonstrating the separation of vitamin E compounds such as tocopherols and tocotrienols in olive oil by supercritical fluid chromatography (SFC) using the Agilent 1260 Infinity Analytical SFC system. Supercritical fluid chromatography (SFC) is a versatile tool to replace separations that to date have been preferably done on a normal-phase liquid chromatography (LC) system. The advantage of SFC is that separations are much faster and of higher precision compared to normal-phase LC. In addition, SFC does not use harmful solvents. Fat-soluble vitamins are typical examples of compounds that can be separated by SFC. A group of such compounds is the vitamin E family. Tocopherols and their unsaturated relatives, tocotrienols, belong to this group in various isomeric forms known as a, b, g, d-tocopherols and -tocotrienols. An amino phase column with a flow-rate of 4.5 mL/min was used to separate the mixture of the four isomeric tocopherols and the four isomeric tocotrienol compounds. The organic composition of the gradient was close to isocratic behaviour, increasing only from 3 to 4.5 % ethanol. This gradient separated the early eluting compounds, and decreased the retention of the later eluting compounds to produce sharper peaks. Calibration curves were generated for all compounds, and a real-life virgin olive oil sample was analysed. The limits of detection and quantification (LOD and LOQ) were determined as well as relative standard deviations (RSDs) of retention times and areas. The Agilent 1260 Infinity analytical SFC system is shown to be effective for the quantification of vitamin E compounds such as tocopherols and tocotrienols in olive oil. The separation of four isomeric tocopherols and four isomeric tocotrienols is shown in a run time of 6 minutes, which is about five times faster than the typically used normal-phase LC methods.